Fighter aircraft are a vital component of any air force and examples such as the F-35 Lightning and Eurofighter Typhoon demonstrate their vast superiority. Airforce-technology analyses the top ten best fighter aircraft in the world, based on aircraft specifications, technology, armament fit and performance. 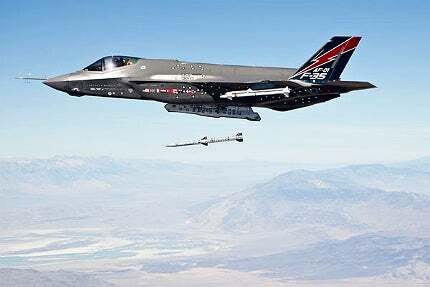 F-35 Lightning II is the only international 5th Generation multirole fighter in the world. Lockheed Martin photo by Matt Short. F-22 Raptor fighters are assigned to seven US Air Force bases. Lockheed Martin photo by Thinh Nguyen. Eurofighter Typhoon fleet has accumulated more than 200,000 flying hours since the entry into service in 2004. Image courtesy of Eurofighter Typhoon. Sukhoi Su-35 advanced multirole air superiority fighter is one of the best fighter jets in the world. Image courtesy of Sukhoi Company (JSC). An F/A-18E/F Super Hornet from the US Navy prepares to land on the aircraft carrier USS Nimitz (CVN 68). US Navy photo by Mass Communication Specialist 3rd Class Chris Bartlett. A French Rafale M combat aircraft takes-off from the flight deck of the nuclear-powered aircraft carrier USS Enterprise (CVN 65). US Navy photo by Mass Communication Specialist Seaman Brandon Morris. The F-15E Strike Eagle of the US Air Force (USAF) flies above Bodø Main Air Station, Norway. US Air Force photo / Master Sgt. Lee Osberry. An Indian Air Force SU-30MKI fighter lands at Mountain Home Air Force Base. US Air Force photo / Airman 1st Class Ryan Crane. The Saab JAS 39 Gripen fighters are currently operated by the air forces of Sweden, Czech, Hungary, South Africa and Thailand. US Air Force photo / Staff Sgt. Joshua Strang. Two F-16 Fighting Falcon multi-role fighters from the USAF conduct Suppression of Enemy Air Defence training over Misawa Air Base. Image courtesy of US Air Force. F-35 Lightning II is the only international fifth generation multirole fighter plane in the world. The extreme agility and stealth features along with integrated sensor package and modern weaponry provide the F-35 with a tactical edge over all other fighter aircraft. The single-seat fighter is armed with a range of weapon systems, such as Sidewinder and Storm Shadow, as well as Joint Direct Attack Munitions (JDAMs). Lockheed Martin is the prime contractor of the F-35, while its major partners include Northrop Grumman, BAE Systems and Pratt & Whitney. The F-35 completed its maiden flight in December 2006. The three F-35 variants, including the conventional take-off and landing (CTOL), short take-off / vertical landing (STOVL) and carrier variant (CV), will replace the A-10 and F-16 of the US Air Force, the F/A-18 of the US Navy, the F/A-18 and AV-8B Harrier of the US Marine Corps and various fighters of other allied nations. The F-22 Raptor developed by Lockheed Martin and Boeing is a single-seat, twin-engine fifth-generation extremely advanced tactical fighter. The stealth, integrated avionics and superior performance make the F-22 super-manoeuvrable fighter. Inducted by the US Air Force (USAF) as an air-superiority fighter, the F-22 evolved into multimission fighter aircraft. The Raptor made its first flight in September 1997. The first production F-22 was delivered to Nellis Air Force Base in January 2003. The aircraft formally entered into USAF’s service in December 2005. The F-22 Raptor employs sophisticated air-to-air and air-to-ground missiles. The emerging technologies integrated aboard the F-22 make it a superior platform for a wide array of missions, including surveillance, reconnaissance, attack, electronic warfare and signals intelligence. Eurofighter Typhoon is a new generation multirole fighter aircraft that is presently one of the best in the world. It is a foreplane / delta wing aircraft integrating modern avionics and sensors, Defensive Aids Sub System (DASS) and distinct weapons, such as Mauser BK-27 27mm cannon, air-to-air, air-to-surface and anti-ship missiles and precision-guided munitions. Eurofighter Typhoon’s development is Europe’s largest multinational military collaborative effort managed by the Nato Eurofighter and Tornado Management Agency (NETMA), which is also the prime customer. The programme delivers cutting-edge technologies for the European defence industry. Eurofighter Typhoon made its combat début in 2011 for reconnaissance and ground strike missions in Libya by the Royal Air Force (RAF) and the Italian Air Force. Sukhoi Su-35 is a heavily-modified version of the Su-27 fighter. The Su-35 is a 4++ generation aircraft employing technologies of the fifth generation. The latest technologies make it superior to all other fourth generation fighters now under development anywhere in the world. The first Su-35 prototype was built at Komsomolsk-na-Amure Aviation Production Association in 2007. The maiden flight of Su-35 was concluded in February 2008. The Su-35 is capable of deploying long and short-range air-to-air missiles, and precision and unguided air-to-ground munitions including missiles, bombs and rockets. The 14 hard-points of the aircraft can carry a maximum weapon payload of 8t. F/A-18E/F Super Hornet is a combat-proven strike fighter offering next-generation multirole strike fighter capabilities. It is a larger and improved redesign of the F/A-18C/D Hornet. The Super Hornet is in service with the US Navy and the Royal Australian Air Force (RAAF). The US Navy inducted the aircraft into service in 1999 for replacing its Grumman F-14 Tomcat. The F/A-18F Super Hornet (two-seat version) entered service with the RAAF in 2010. Combat capabilities of the fighter jet were proved during Operation Iraqi Freedom, Operation Enduring Freedom, Operation Southern Watch and War in Afghanistan. The Super Hornet’s suite of integrated and networked systems provides enhanced interoperability and total force support for the combatant commander and for troops on the ground. The 11 weapon stations on the aircraft can hold mix of air-to-air and air-to-ground ordnance, as well as a variety of smart weapons, including laser-guided bombs. Described as "omnirole" fighter by its manufacturer Dassault Aviation, Rafale is a twin-engine, multirole fighter aircraft that is capable of performing air sovereignty, deep strike, reconnaissance and airborne nuclear deterrent duties. The multirole fighter is operated by the French Air Force and Navy. This aircraft features latest avionics and smart sensor systems. It can carry a 30mm cannon, air-to-air and air-to-surface missiles, nuclear and anti-ship missiles, as well as a range of laser-guided bombs and ground-attack munitions. The maiden combat deployment of the Rafale fighter was in 2002 during the Operation Enduring Freedom. The aircraft has been used in a number of combat missions in Afghanistan, Libya and Mali (Operation Serval). The aircraft is available in three variants, namely RAFALE C single-seat, RAFALE M carrier-based single-seat and RAFALE B twin-seat version. The F-15E Strike Eagle is a superior next generation multirole strike fighter. Developed as a derivative of earlier F-15A/D aircraft, the F-15E is the backbone of the US Air Force (USAF) today. The F-15E can carry up to 23,000lb of payload, including the Joint Direct Attack Munition (JDAM), AGM-130 Standoff Weapon System, the AIM-120 Advanced Medium Range Air-to-Air Missile (AMRAAM), AIM-9X Sidewinder and a variety of bombs. It can fly at more than twice the speed of sound. The state-of-the-art avionics systems provide the Strike Eagle with the ability to conduct air-to-air and air-to-surface missions in all weather conditions during day or night. The F-15Es were extensively deployed by the USAF in Operations Desert Shield and Desert Storm as well as Operations Southern Watch and Northern Watch. Other notable combat deployments include Operation Deny Flight, Operation Enduring Freedom, Operation Iraqi Freedom and Operation Odyssey Dawn. Su-30MKI (Flanker-H) is a two-seat, long-range multirole fighter in service with the Indian Air Force (IAF). Designed by Russia’s Sukhoi, the Su-30MKI is assembled under licence by India’s Hindustan Aeronautics Limited (HAL). The first Russian-built Su-30MKI variant entered into service with the IAF in 2002, while the first India-made aircraft was introduced into the IAF in 2004. The Su-30MKI features multinational avionics and sub-systems, as the components are supplied by 14 manufacturers from six nations. The Su-30MKI can carry a range of air-to-air and air-to-surface missiles, including the Brahmos supersonic cruise missiles. The armament also includes a 30mm GSh-30-1 gun and variety of bombs. Saab JAS 39 Gripen is a new generation, lightweight multirole fighter for performing an extensive range of air-to-air, air-to-surface and reconnaissance missions. The delta wing-canard design makes Gripen the most agile fighter for close combat scenarios. The Gripen fighter entered service with the Swedish Air Force in 1997. The aircraft is currently operated by the air forces of Sweden, Czech Republic, Hungary, South Africa and Thailand. Gripens were deployed in combat missions in Libya to support the Operation Unified Protector in 2011. Gripen NG, the new version of Gripen C/D can be armed with METEOR, AMRAAM, IRIS-T and AIM-9 missiles. The new generation aircraft incorporates a multifrequency data link, fully integrated avionic mission system, long range PS05 multimode radar and sensor fusion. F-16 Fighting Falcon is an extremely combat-proven, single-engine, multirole fighter. Primarily designed by General Dynamics to perform air superiority missions of the US Air Force (USAF), the F-16 evolved into a multirole aircraft over time by incorporating latest technologies. F-16 is a highly successful fighter aircraft with 26 nations owning it, more than 4,500 built to date and 54 more on order for 15 clients. The aircraft made its combat presence during Operation Desert Storm in 1991. F-16s were extensively used in various combat missions in Iraq, Afghanistan and Libya. The latest F-16 versions, Block 50/52 and Block 60 incorporate modern technology and upgrades based on combat experience. The new versions of F-16 are delivered with advanced avionics, state-of-the-art pilot-friendly cockpits and instrumentation, as well as discrete sensors and weapons packages. From the latest-generation flight simulators to the world of gaming consoles, simulations are used in every walk of life. Nato is on the brink of fielding an integrated air command and control system in four member countries.